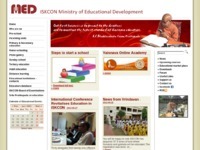 The official website of ISKCON’s Ministry of Educational Development whose mission is to facilitate & develop ISKCON’s educational system. It aims to establish, maintain & monitor effective quality systems to instruct & train all devotees in the principles of Krishna Consciousness, to equip children with all the skills required for a productive life in Krishna Consciousness,etc. Category Education, ISKCON Ministries June 9, 2012 by ISKCON Desire Tree.